I’m still sewing… although hit some hurdles. So what I have been doing? Every year my life goes into overdrive between October and March. The pressure is constant. I am quite resilient, very organised but I’m exhausted during the peak period and completely knackered at the end of it. While the peak of the workload culminates in a rather fun presentation… it is preceded and followed by oceans of work. Last year I made my dress for this event however I didn’t make my dress this year. When you are working on an exceptionally tight deadline, sometimes you need to be kind to yourself. So I popped out in my lunchbreak the day before the night, tried on one dress, it fitted and I wore it – some days it’s best not to overthink it (even when you have shocking tan lines!). I was stopped the following day by a lady and her husband to tell me how much they loved my dress and they were dying to know what it was made from. I laughed and said “Sequins and attitude“. I’m glad I did buy it, one less thing to think about. I dread dressing up but yet when it comes to the actual event, I absolutely embrace it and love every minute of it. A reluctant party girl I guess! Note: I’m rarely this glamorous but heck it’s fun to indulge every now and then. Definitely not made by me! Rushed and somewhat scruffy lift ‘selfie’. Bonus dirty mirror photo for earrings and on the way out for drinks after! Trust me I do prioritise my life – and I am only doing what needs doing these days (2017 is My Year of No). However with kids to care for and a mortgage to pay (and they are rather high in Port Macquarie and good jobs are scarce). My job is demanding and more often than not exhausting, working 5 days a week and getting through each day, afternoon and evening is a trial in itself! My youngest started high school and I’m still trying to find the rhythm of a new year and all the activities that it involves. I’ve started hockey training again. I doubt I’ll ever be much of a hockey player but it’s fun and I love the team. I’ve been trying to run a few kilometres a week as well… when time permits. I’ve had some friends who have been amazing and kept me somewhat sane during some challenging times lately. Several times I’ve deleted all the social media apps to give myself some space. I log back in every now and then and then I’m gone again for a while – there’s a lot to be said for social media holidays. My phone died so rather than being annoyed by that I’ve just embraced being communication-free most of the time (well apart from the deluge of work emails of course). The lack of ‘noise’ is nice and while there are some people and conversations I miss, I’ve learnt to live with that. Yes, I still think about it constantly, daydream and plan. 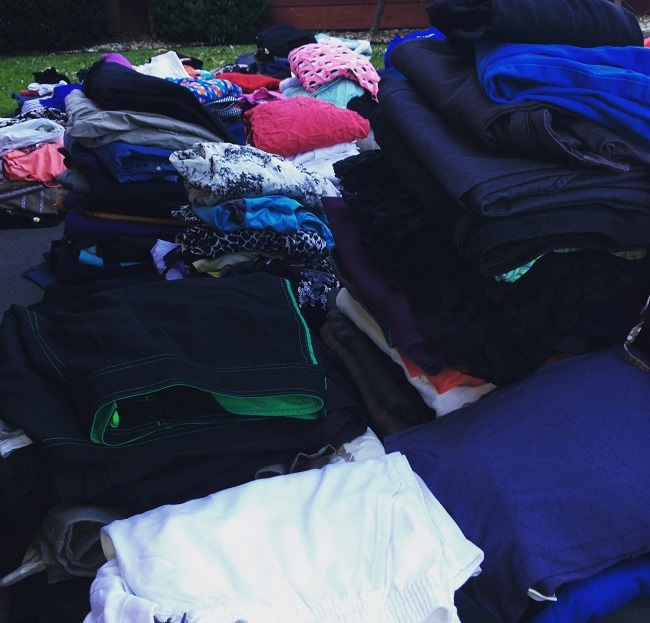 I’ve made a few garments… started several and stopped. Washed fabric and sorted through patterns. Traced patterns. Maybe like a glamorous event, I just need a bit of inspiration to get started again. I made a lovely Grainline Archer in a foiled crinkle cotton – and haven’t managed to photograph it. I’ve worried about how it will photograph as the foil makes any creases quite savage although I’m pleased with the shirt itself. That aside, I found it really relaxing to indulge in the process of shirt making, I love all the details and steps. Perhaps I need to go back to sewing things I simply love. Dresses, shirts, jackets… I think I might attempt a dress to wear in Brisbane in April. Grainline Archer – the ruffle back! We have had an appallingly hot summer with record-breaking temperatures. I think we have survived three heatwaves this year, with temperatures rocketing to over 40 degrees Celsius. A couple of weekends ago it was 46.5 degrees(!) so the thought of sewing has been rather unbearable so far this year. Fortunately the temperature has dropped to a balmy 28 degrees most days – which is our usual summer temperature and it’s utterly delightful by comparison. Self confidence. I feel like anything I might sew is going to end up a disaster. I feel like that about most things at the moment! I think most of us hit that hurdle at some point, for whatever reason. Sewing doesn’t solve life’s problems but it certainly helps me relax. On the days when I’ve had time to sew and not known what to do or where to start, I’ve simply laid on the floor of my (tidy!) sewing room and quietly daydreamed/worried/thought/planned. There are worse things to do. It’s nice to have a ‘space’ for me, as Virginia Woolf once wrote ‘A Room Of One’s Own’. I can’t quite figure how or when to take blog photos. This has been a big issue in the last year and it’s even harder now… maybe I need a tripod and a remote. That’s another project to find time to research/purchase. I always found the process of writing a blog post the best way to move onto the next project. There is something about the consideration, the writing and assessment in a blog post that helps me mentally sign off on a project. I miss that. Where to from here… well at least in this blog space? hmmmmm, good question. I have considered not blogging. However I love the connection blogging provides and the way it makes me reflect on my projects. I also love having a record of my sewing. And that’s all I really started blogging for. Simply to communicate and record my makes. That’s really all there is to my blog. So that’s what I’ll continue to do. 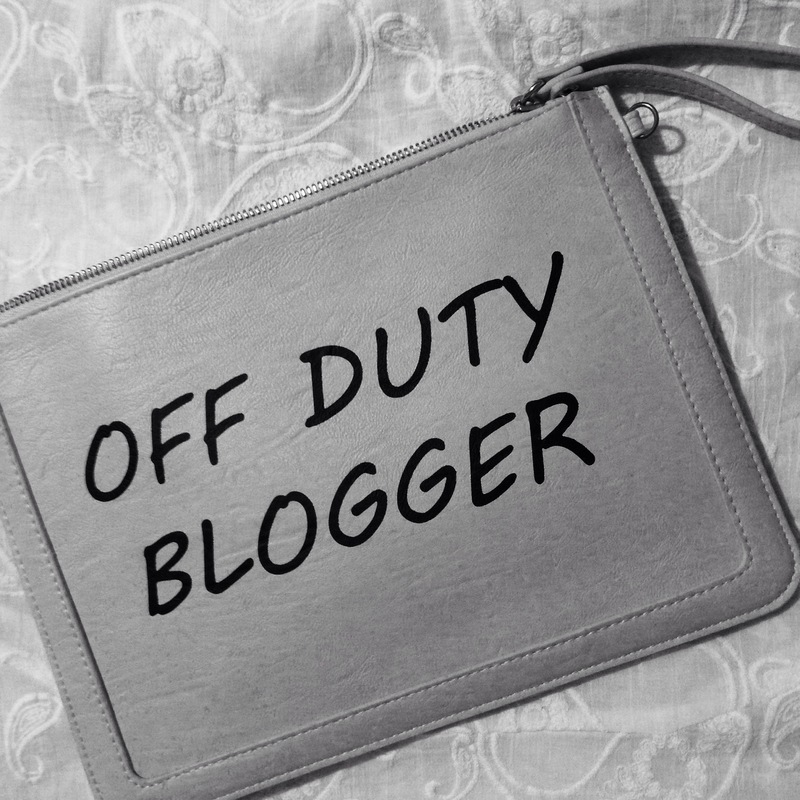 So once I figure out how to get the blogging back on track, I’ll be back. I know. What a waste of a blog post. If you haven’t fallen into a coma by now, thanks for hanging around. See you sooner rather than later hopefully. Maybe with a Shining Archer! …or I could just relax for a few weeks. Seaside Spring Sewaway – update! I’ve just enjoyed the first weekend free of commitments for an entire month – and it was wonderful. May was chaotic and stressful. I’m just catching up on ‘life admin’ at the moment. I went to the gym for the Saturday Body Pump session, it was the first time in… far too long… and as a result I can barely move tonight. Oops. Tomorrow is not going to be pretty. The ever-beautiful Nobbys Beach – location of many of my garment photos… mainly because Banjo can run free there! The Seaside Spring Sewaway is definitely on this October. I’m moved it to Saturday 3 and Sunday 4 October as it’s a long weekend which makes travelling much easier for many. I’ve booked a room in the heart of Port Macquarie’s CBD which is located on the riverfront and a stroll from Town Beach along the breakwall. There is a wide range of accommodation, restaurants and cafés within a few blocks. The room has electricity, plenty of tables, chairs, tea/coffee making… and you get to stroll through an art gallery as you arrive & leave. I know, I spoil you. 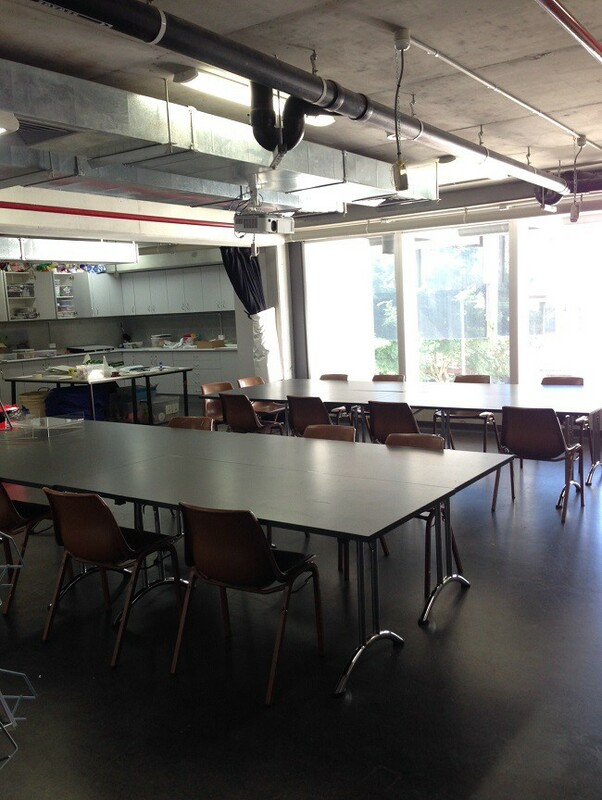 I’ve done a weekend workshop there before and it’s a lovely space. You can fly or drive to Port Macquarie. We are about ten minutes off the highway (four hours north of Sydney & about six and a half from Brisbane – roadworks dependent!). There are direct flights from Sydney & Brisbane as well – I can pick you up at the airport & drop you into Port’s CBD. Part of the beauty of being a holiday destination means there is a full range of accommodation available from camping to backpackers, serviced apartments or hotels. Most places are close to the river or beach – and we have a beautiful coastal walk which takes you from the CBD past all our beaches to the lighthouse at the southern end of Port. Note: bloggers and non-bloggers welcome. I don’t believe you need a blog to prove your love of sewing. I’m providing the sewing workshop facilities. No charge. Just enjoy. I’ve made so many friends & had so much fun that’s it’s just something I wanted to do. Just bring your machine, sew, relax, chat, eat, walk on the beach – have fun. A weekend away isn’t cheap so the sewing workshop is my gift to those that trek to my little patch of sand, salt and (hopefully!) sun this October. That said, if you do want to come I would suggest booking accommodation sooner rather than later as a long weekend in Port Macquarie is a busy time! The RSVP is to ensure I haven’t over or under-catered for a sewing space. If I need a bigger room I’ll need to know so everyone has ample space – or smaller which will save some pennies. If there is interest in a dinner then I’ll set up a pre-payment system as I can’t afford (or the rest of the group) to cover for no-shows. That’s pretty reasonable I think. 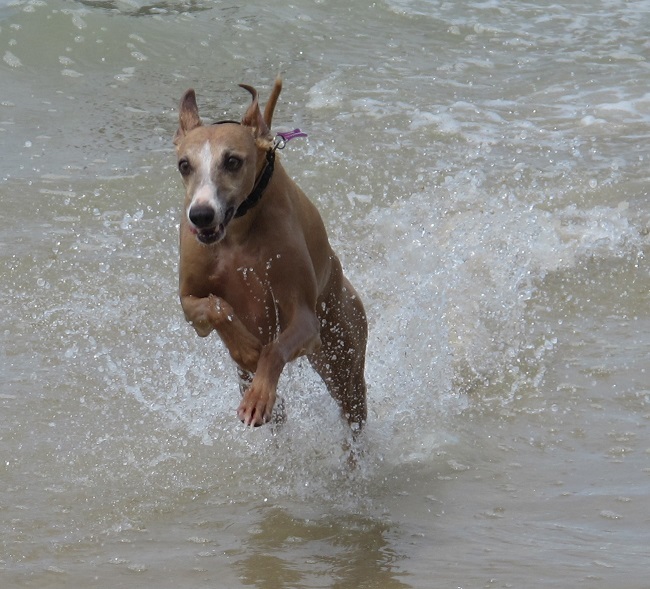 Heck, I’ll even throw in an early morning beach stroll with the now infamous whippet, Banjo. Take some blog photos! What more could you ask? So are you in? Banjo – my favourite water rat. Perhaps the star attraction for a sewaway in Port Macquarie – free addition to your blog photo shoots! Sorry no sewing news follows – I exist beyond sewing and if it’s not of interest… you can ‘pull up stumps’ here. I wasn’t going to put any of this here – however life has been getting in the way of sewing so for me it’s relevant (to me) – what could possibly tear me away from the machine and blog for so many weeks??? I was rather overwhelmed with life in May. I’m so glad it’s over and those who followed my adventures on Instagram, cheered me on and dropped me emails and messages… thank you! Sometimes those words of encouragement and laughter helped get me through some very long and tiring days! 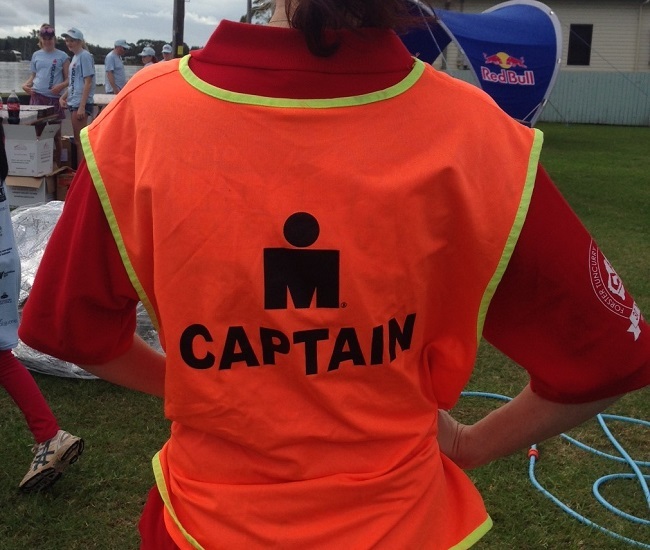 I kicked off the month as an Ironman run leg aid station captain – organising 90 volunteers to serve 1,700 athletes coming through the station four times over 12 hours. I started at 10.30am and got home at 12.30am. I’d love to tell you that I did it for altruistic reasons. Not strictly true. It raises funds for the school … but I love Ironman, it’s such an amazing event. While the professional athletes are impressive… it’s the ‘ordinary’ people pushing themselves to extraordinary lengths that bring me back every year. It takes a certain amount of personal grit to swim 3.8kms, cycle 180kms and THEN run a marathon… amazing and humbling stuff. We had some HORRENDOUS weather in the lead up to the day… and I was slightly concerned by reports that my riverside aid station may experience minor flooding in the evening… fortunately the river didn’t rise quite that much! Highlights of the day are on youtube… however if you want to see just how pretty Port Macquarie can be (minus the floodwater and clouds) – better watch the 2014 highlights! My eldest is mad about dancing… and it drives me mad some days! At the moment I’m looking forward to enjoying some ‘normal’ life. I’ve got some trips planned, so I might see you in Brisbane (twice this winter) or Melbourne (Melbourne Frocktails of course). I’m sad that I can’t make it to Canberra – because I love the Canberra crowd… and I love Canberra itself… I’m hoping there is another in 2016!